What Are Atlas Treatment Chiropractors? Home/Atlas Treatment Chiropractors/What Are Atlas Treatment Chiropractors? The atlas, or C1 vertebra, is the top bone in the spine. It plays a number of key roles in the body, meaning that even the trinities of misalignments can have negative effects on the central nervous system (CNS) and other vital body functions. We’re going to take a closer look at the role the atlas plays. Then we will discuss a subspecialty in the chiropractic field called upper cervical, so you can learn more about what atlas treatment chiropractors do and the benefits that can be derived from this natural therapy. There are a number of ways that the atlas plays a key role in the body, but let’s start with one of the obvious functions. It allows you to move your head. The atlas and axis (top two bones in the neck) are uniquely shaped among the vertebrae. This is why the head has such a wide range of motion. The way the atlas meets the skull creates a joint that lets you nod your head forward and backward. The joint between the C1 and C2 is responsible for the left to right turns of the head. In short, more than half of the head’s range of motion is thanks to the unique position and shape of the atlas. Unfortunately, this unique position and shape may also be why the atlas is prone to misalignment. However, we will discuss how to correct such an issue later on in our article. For now, let’s look at the next vital activity the atlas carries out – it protects the brainstem. The brainstem is attached to the spinal cord. Messages that travel through the central nervous system come through this mass of nerves. This is the part of the body that is responsible for the unconscious activity. For example, it tells your lungs to breathe without you having to consciously take in a breath every few seconds. It also controls blood pressure, heart rate, digestion, tells the body when to release certain hormones, facilitates the changes from being asleep to being awake, and more. The atlas surrounds the lower part of the brainstem, right where it meets the spinal cord. As a result, proper alignment is a must. Even the slightest misalignment can put pressure on this vital part of the central nervous system and can affect all of the functions that it performs. Finally, we have to consider the role this bone plays when it comes to making sure the brain has a complete supply of oxygen-rich blood. The vertebral arteries bring blood to the head after it has received oxygen from the lungs. So what does the neck have to do with this oxygen supply? Each of the seven vertebrae in the neck has two tiny loops of bone called the vertebral foramen. The loops provide safe passage for the arteries that bring blood to the head. However, this also means that misalignments in the neck can affect this free flow of blood. Less blood means less oxygen, and that translates into problems in the central nervous system. Since the atlas is so important, you can’t leave a misalignment untreated. Therefore, let’s take a closer look at what atlas treatment chiropractors do to correct the underlying issue. How Atlas Treatment Chiropractors Can Help? Upper cervical chiropractors are subspecialists in the chiropractic field who focus on the atlas. What does this specialized form of care involve? Precise measurements of the atlas misalignment – This is a key part of upper cervical chiropractic. Atlas treatment chiropractors will use modern diagnostic imaging techniques to precisely pinpoint the location and degree of the atlas misalignment. Some diagnostic imaging techniques can detect misalignments down to hundredths of a degree. The vital importance of the atlas explains why such miniscule subluxations can make a big difference in a person’s health. Low force corrections of atlas misalignments – Once precise measurements have been taken, your atlas treatment chiropractor can calculate the exact adjustment that you need. Since adjustments may only require that your atlas move a fraction of a millimeter, the corrections are very gentle. There is none of the popping and twisting that most people associate with chiropractic care. Most practitioners will use either an adjusting instrument or a series of gentle touches just below the ear. Long-lasting benefits – You may need several adjustments to give the soft tissue of your neck time to stabilize. However, once your neck begins to heal from any underlying damage, your atlas adjustments should hold for weeks, months, or perhaps even longer. For many patients, office visits become a check-up, just to make sure that the adjustment is still holding. If your atlas treatment chiropractor determines that the atlas is still in place, there is no need for an adjustment on that visit. 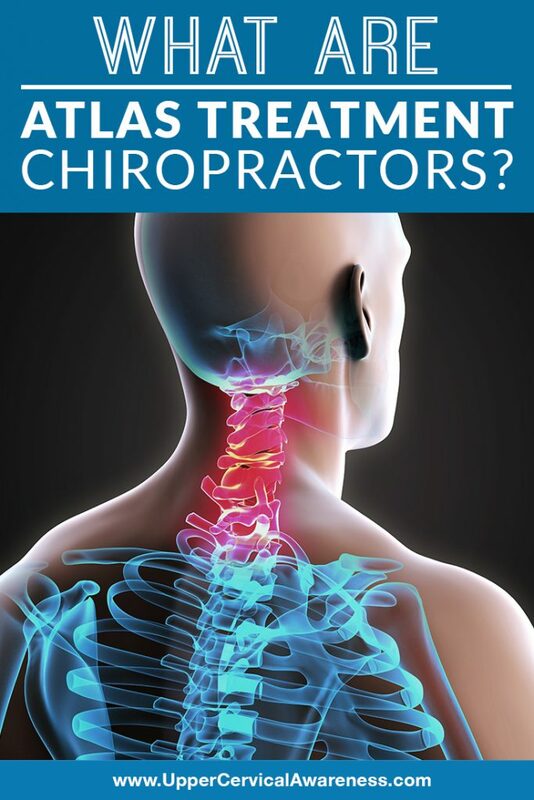 Are you ready to find an atlas treatment chiropractor near you? A quick search can help you to locate an upper cervical practitioner in your area. Then the next step is up to you. All you have to do is schedule an appointment or even a no-obligation consultation if you still need a little more information before making a decision. You may be just one examination and a few gentle adjustments away from greatly improving your quality of life. From helping with symptoms like headaches and vertigo to offering relief from chronic conditions like migraines and fibromyalgia, find out what atlas treatment chiropractors can do for you. UCM Social Media Team2019-02-02T16:59:32+00:00December 31st, 2018|Atlas Treatment Chiropractors|Comments Off on What Are Atlas Treatment Chiropractors?